Daily contact lenses are the most convenient and safest way to wear contact lenses, but, in the past, the cost of buying have put people off wearing them. We have listened to our customers and searched the world for a low cost, trouble free daily contact lens to provide our customers with the convenience of daily lenses at the lowest possible price. We have found a lens that has it all - Crystal 1 Day. 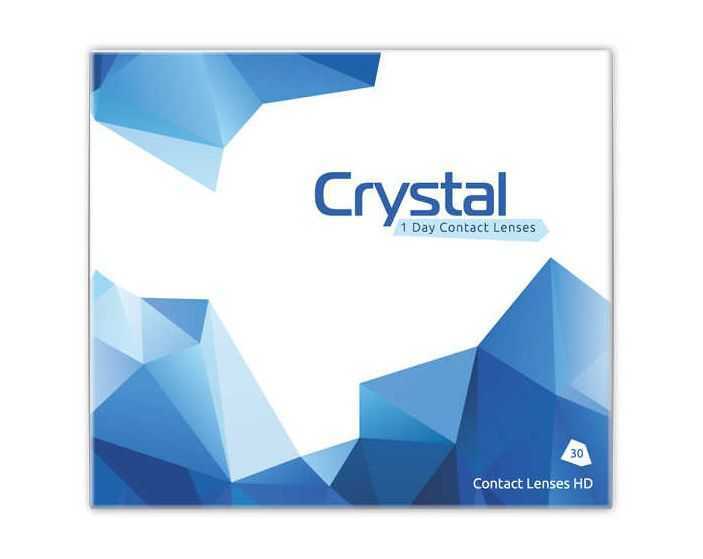 With Crystal 1 Day we bring you a lens that offers aspheric optics for great focusing,a moisturising agent for all day comfort, multi back curves to provide great fit, superb handling, an easy to open packet, UVA & UVB protection, CE and ISO approved for maximum safety and an easy direct replacement for existing daily lenses on the market. After extensive testing and trials we are happy with our choice and we are confident that you will find them a great replacement for your existing daily lenses. They are also a low cost daily option for monthly lens wearers - no more storing lenses every night in expensive solutions, simply wear a pair for a day and throw them away! Each box contains 30 soft contact lenses each with a light blue handling tint in a buffered sterile saline solution. Material: Methafilcon A 45%, Water Content 55%. New: We have introduced a new daily lens for dry eyes and even more comfort - Crystal Aqua Daily, at a promotional limited offer price of only £5.99 / 30 lenses. These are definitely handy to have as spares if you wear contacts for only part of the day. I found I could not wear them for more than 1/2hr before they became uncomfortable and within an hour, they needed to be removed. Thought I would give these lenses a try, don`t wear mine too often so needed back up pairs. These arrived very quickly and i don`t know if it`s due to them being ever so slightly bigger than my usual lenses but they are the most comfortable I have ever worn. Usually, around midday, my eyes would start to rebel and get gritty etc but so far after 10 hours of wear, nothing but comfort and for what i think is the first time ever and that`s over 20 years of lenses, i can`t feel them in my eyes - a bargain but a brilliant bargain. Tried these for the first time and they took a while to get used to, but are absolutely fine now. I consider them good lense and worth giving a try. These contacts are super comfortable and easier to put in than my regular brand. I was so surprised! I will be ordering these from now on. This is a steal of a deal. This company ships quick international as I only had to wait about 4 to 5 days. Awesome company!! I will return to order in the future I'm simply amazed! Took about 2 months to be able to wear them all day without dryness. I've been now wearing them for 3 years and I wouldn't ever go back to a monthly contact. Love this lenses. They are super comfortable for my eyes. I tried before more expensive versions but love this much more. Nice price and super fast delivery what I really appreciate!!! Would you like us to let you know when powers are back in stock? Would you like us to contact you to discuss alternatives? If you proceed with the order, we will replace Crystal 1 Day with Soflens Daily Disposables, which is a very similar lens, at no extra charge.